The CoffeeShop Blog: What in the world happened to LEGOs? What in the world happened to LEGOs? 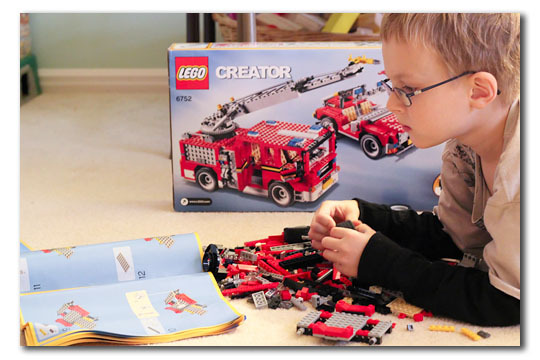 to build three fire rescue vehicles (fire truck, jeep and helicopter) and detailed step-by-step instructions. Duke loves it and it is a great building project for Daddy/Mommy/son time. But I have to ask, what has happened to the LEGOs I knew and loved when I was a child? Remember when you would go over to your friend's house and they would pull out this huge box of multi-colored multi-sized legos? You would dump them on the floor, pick out the dog hair, poptart crumbs, and barbie doll shoes, and start to build Something. No instructions. No fancy windows, elaborate turning wheels, tiny gears or chicken drumsticks included. But what came with those LEGOs of old was one of my favorite things; imagination. You could build a house, a spaceship, a bug, or a ship. There were no limits as long as you had enough blocks. You will be hard-pressed to find a simple LEGO box set in Target or Walmart these days. Instead, you will find complicated sets to build three different houses or construction vehicles, Star Wars vehicles and SpongeBob houses. I had to really search to find this plain LEGO Ultimate Building Set from Amazon. I realize you can ignore the instructions and be creative, but these kits come with tiny specific pieces your kids probably won't use and these kits are expensive! I like the simple blocks best. This reminds me of a commercial I saw the other day. It began with this adorable baby sitting in the middle of the kitchen while Mommy was cooking. The baby was banging a set of Mommy's pans with a wooden spoon. "Babies love to play in the kitchen", the voiceover says as it pans over the adorable scene. Anyone who has been around a baby knows how much fun they have banging on pots and pans. And this baby was obviously having a wonderful time AND staying out of Mommy's hair. I am sure this is an acceptable toy, but Baby was perfectly content with her pots and pans. The commercial actually mentioned this in the beginning, so why am I being encouraged to spend over $30 on this toy? There is not much imagination involved with this kitchen as everything has a specific purpose. And don't get me started on toys that try to teach babies colors, numbers, and a second language... Put an "educational" label on a toy and you are sure to sell more of them. Back to the LEGOs. My son loves his Fire Rescue set and it teaches him to follow instructions. However, it seems like many toys these days are more about teaching our children to grow up to be little drones rather than creative imaginative adults. I have to ask myself what type of future world are we creating? Sure, it is very important to be able to work hard, follow instructions and finish a project. We all have to be good little drones at various times in our lives. But many of the things that make this country great are the creative minds that built it. These new LEGO sets don't encourage creativity (unless you ignore the instructions of course!). Lose one piece and your kids might be tempted to tell you to toss it because now they can't build the firetruck anymore because the instructions must be followed. I don't want to bash the new LEGO sets or baby kitchens. But I do think it is important to let your baby bang on pots and pans and eat a few crumbs off the floor while you are in the kitchen. And your little boys and girls need to have some simple toys that spark their imagination and don't require them to follow huge booklets full of instructions. Look around your house and yard and you might be shocked to find that you already have plenty of toys. Pillows for a fort, an old quilt for a picnic blanket, sticks and pinecones to build a fairy house, cards, old magazines to cut and paste, or marbles and paper towel rolls for building marble slides. Looking around with a child's eye is a great way to rediscover your creative side. We need future adults who can think on their own and can imagine a future of possibility. We need future adults who looked at a box of LEGOs and got excited planning what they were going to create, not what page they were in the instruction manual. Duke has two of those fancy LEGO sets (the other purchased ironically by me last year). Once he has built both sets I plan on mixing all of the pieces together and tossing the instructions so we can build some wild and crazy things. I can't wait to see what we can create together. My kids sets are all mixed up and now they tell me they can't play with them because they don't have all the pieces for the sets. Hello there! i was read the great post here. And my opinion, LEGOs give child enjoy playing and at the same time, give they thinking creatively. Shahrul, I totally agree with you that LEGOs are great creativity builders, but I just think the new sets don't encourage that much imagination. Amie, you made a perfect point! It is so sad that kids are taught to follow in lock step and not play out side the box, my kids are 47, 42 and 31 so believe me, they learned to play out side the box and inside the box, big cardboard boxes..lol..that was their favorite toy, no matter what gift they recieved the box was their favorite part of it, they built Forts and cars and spaceships...they learned to use the imagination...towels where Superman capes and sticks were swords used by knights riding their stick horses. Legos were in large boxes and dumped on the floor to make what ever came to mind. Now kids have no imagination, they have to be told every move to make. It's true, it gets harder and harder to find Lego that doesn't come as a set. But the good news is that at least all the pieces still fit together, regardless of set. Now that my kids are older, the sets have all just gotten mixed together, which makes it a lot more like pieces in a big bucket. Lego stays useful even after it's broken free of the set! AMEN!!! My 5 year old keeps asking for legos and we bought him the same bucket of pieces for Christmas. BUT- like you, its the ONLY thing I found that wasnt a set of legos to build something. I dont want only Buzz colored pieces, or the parts to build a space station. I just want a PILE OF LEGOS!!! and really, so does he. He uses his trios (which are a younger version of the lego sets- complete with directions) to build many things besides the bug its "supposed" to be. Another great building toy we have (thanks to grandma!) are these magna-tiles (http://www.growingtreetoys.com/product/magna-tiles-32-piece-clear-colors-set) they are kind of pricey, but its really the inside toy he spends the most time playing with. He is always building new things with them. Garages for his hot wheels, space ships for his batman figure... TONS of stuff. LOVE them! Love this post! Here in Sydney, Australia you can still buy tubs of lego that don't come with fancy instructions! Kids aren't allowed to be kids anymore - too much tv, computers and 'educational' programs/groups/activities etc. Kids are happiest (and healthiest) when they are allowed to be children. I agree with you. I have bought the learning things for him because I don't want to be the mom who didn't but the best thing I ever bought him was mini helmets ($24 at academy) they have every team in the NFL they are probably more for decoration but he uses to create "formations" and he has them all play against each other in their our football game. You never no who will be playing against each other when you walk in his room. Before we got the helmets he used his monster trucks as football players. I agree...and disagree. My 6yo has learned a lot about how to build with legos because of learning how to follow the directions in the booklets. However, he also loves building his own creations, so his "sets" don't stay together very long (much to my chagrin). Rita - though I wholeheartly agree with your assessment, a child raised in an environment where creativity is NOT nurtured will do EXACTLY what you mention with LEGOs, follow the instructions and leave it at that. The LEGOs are merely a manifestation of the bigger problem. My wife purchased a box of "by the pound" random LEGO pieces from Ebay - a mixture of thousands of random pieces - no instructions - the best investment EVER!! And although we have purchased a few of the sets you've mentioned, those pieces very quickly get tossed in with the others for new inventions. Don't be discouraged - LEGOs still are the perfect toy for imaginative play, IMHO. Wish you lived closer - you guys could join us for "family LEGO night", as my son calls it! LEGOs are still great for imagination play of course, esp. if you don't follow the instructions, but if you buy the kits they are so expensive! Over $50 for some of them which is crazy. Buying the simple blocks is so much cheaper and then you don't have all of those crazy tiny parts. I completely agree with your post. I loved playing with Legos when I was a kid. The funnest part was trying to decide what to make. Thanks for the link to the bin. My DS is too young for them yet at 2.5 years, but I'll be looking for them later. For now it's still Mega Blocks for us. Something to think about. It gave me a new appreciation for how my toddler son plays. I've been thinking it was silly how he likes to take his sock off his foot and put it on his hand but I he's actually being creative. I guess I wasn't thinking creatively myself. Thank you. It does seem that we need to be reminded that creativity is a good thing. Um, why DON'T you just mix all the Lego packs together and tell them to have at it? That's how I grew up playing with Legos... we had a bunch of set and they were all in one box. If we wanted to make something specific my mom had the directions all together in a file, but mostly we just built whatever we wanted. I think it's kind of silly to get all upset over something like that. With Legos, as with most kid toys, the "maps" (as we called them) are there for suggestions, they aren't the rules. Kids can play however they want. I don't see anything wrong with toy manufacturers trying to sell their products... we all have to make a living. Garage sales are the best for stocking up on LEGOs. All the sets are mixed up and most of the time the directions are lost! And the price is awesome! My boys are a bit too dependent on the instructions, but they are starting to branch out using their imagination. It's probably because their giant bin of LEGOs is full and they were told NO MORE! And is it just me or does it seem like these new sets never stay together? My 4-year old has actually asked me to get a new one when the contraption we've just built broke! My son is 16 and he still has the battleship Lego set he got when he was 8 and put it together with his dad - it is on his shelves now and everytime I dust I knock a couple pieces off :-) Good thing I don't dust a lot. These sets aren't new. I remember following the directions to assemble a tree fort, and a hospital over 20 years ago. But once we had assembled it, and of course after it sat on display for a few months, it got disassembled and all the pieces went into the bucket of various pieces - and then a new creation was born. There is a time and a place for both. don't do that those little pieces will be inspiration for them to build very wild and weird creations. We've bought thousands of dollars for our now 14 year old and sometimes he'd building what was on the box sometimes he didn't sometimes he just created his own creations. He built submarines out of helicopter parts amoung other things. I keep a large rubbermaid with a lid and I just dump all the legos in there. I do let them keep the instructions, but I do not sort them. More often than not, they end up doing their own thing. By the way this year I found the Lego brick box on amazon (like the one I had as a kid, but plastic instead of cardboard.) Bonus: they look a little bigger. I am always afraid someone is going to swallow those little ones. You can buy a box of 650 generic lego bricks at Target.. :) I think its $29.99. I know because my brothers own about 1500 legos and my mom refuses to buy them the sets you mention. My son grew up with the "tub" of Legos and was so creative. It is so fun now to watch his "big" eyes light up when I put that tub in the floor (he's 29!!) I agree, they have to grow up much too fast these days. Merry Christmas! I have felt exactly the same way. Hopefully there are enough of us raising kids with fairy houses and sheet forts, that creative and imaginative minds won't die out. I've often thought about my mud pies vs the plastic ones and wonder what happened. We complain about kids getting overweight and sick but what are we as a nation doing to change that? They need activity and fresh air, not to mention TONS to grow that imagination. More "education" is what's pumped in. I'm with ya on this one honey! Children learn through play. PLAY. It doesn't always have to be an Einstein moment. I agree and don't agree. I am a grandma to 9 young children who love LEGO. We still have the lego from our son's first set given to him almost 50 years ago + piles more given through the years. One was a train set that took his Dad and him forever to put together. It was a fun father/son project at the time. Now the train pieces are mixed in with all the rest and the grandchildren love to build their own trains and use the tracks to make a circle or whatever to run the †heir creations on. In the past few years my now 7 year old grandson has slept over almost every Friday night. He has a huge imagination, but putting together Lego sets has become a fun Grandma/Grandson project. At first I had to help him (back when he was almost 6) but soon he became an expert at reading the instructions and snapping those pieces together as per the instructions! He found it extremely interesting as these sets are very detailed even the inside parts that get covered up. He learned about pirate ships, cars, trucks, and things that accompany rescue vehicles along the way. He also enjoyed playing with the vehicles and having his own imaginary time with them once they were built. Lego sets are only done at Grandma's and he lovess this special time spent together (sometimes I just sit and knit next to him while he builds). He always has questions about each item - not about how to build it - but rather about the item itself such as "where do the men learn to be rescuers" etc so we have some great conversations! At home all the Lego is in a few big tubs and he builds to his hearts content anything he wants. As the Lego falls apart at Grandma's it is sent home with him to be added to his tubs. Sorry this was so long, but LEGO has been a part of my life for at least 50 years and is dear to my heart. It is a timeless toy that will always provide hours and hours of quality, creative fun whether bought as a set or as a mix. But it is great to see that most of you use them to encourage creative play. :-) I completely agree that the sets can be useful on two levels; teaching children to follow instructions and learning how to create new things not on the box. I am a Lego child - meaning there was an abundance of Legos in my house growing up. I'm talking straight up Legos, no kits, special editions, etc. Just a huge bin of assorted Lego pieces. Now that I have kids of my own I often look for Legos but am disappointed by the selection in most stores. Its ALL sets or themes or mini sets. And I don't remember Legos being quite so expensive but then again I wasn't paying for them back then. I do agree the "sets" can allow for learing to follow instructions but I do think they tend to limit creativity. Kids are creatures of habit. If they build the same thing over and over they're likely to just keep building the same thing and where's the fun in that? If you have access to an actual Lego store I highly recommend visiting one. You can purchase sets (if thats what you want) but the coolest thing is the ability to purchase mix and match pieces. You can get standard pieces, wheels, windows, flowers, those big green base pieces, even little people. Basically - everything they sell. You get to pick the colors, how many of each one you want, etc. I agree with you! My boys want Lego Star Wars but I look at them and my first thought is that all they can make is that specific thing. They can't creat a single tpother thing because the pieces are so specific. And in our home, at least, its not a matter of if, but when pieces will be lost and the intended creation won't ever be the same! Just reinforced my opinion. LEGOs are so much more than the cookie cutter creation that come in the box. My son is 8 and since he was 4 he has gotten a lego set for every gift holiday. I love how he is so creative with them. He usually builds the thing first with the instructions, but he is the kind of kid who can't leave things alone, within minutes he is adjusting it and adding parts and taking parts off, and soon the original thing from the instructions is not even recognizable anymore. He has this huge tub of legos now and the instructions are long gone. He can create anything now, especially with the specialty parts like hinges and gears to make his own creations. I personally think that Legos are the best toy for imagination for boys. It is pure creativity and engineering at work. My husband has a huge tub of legos from his youth too and he does complain that the parts now a days are not as generic, they are more fit for a purpose, like one large boat piece today would have been built with 15 pieces back in the day. They are sure expensive, but we will continue to buy them for years to come I'm sure. We found the exact same problem with Lincoln Logs... Great post, and thanks for all you do!! I remember my brother receiving a Lego space station for Christmas 30 years ago. My only complaint about Lego "sets" is the consumer mindset that they fuel. Even with a fantastic supply of Legos in our home, there is the cry for more as new characters are revealed. The specialty pieces have not slowed my boys (7&9) down in the creativity department one bit. I appreciate the way that my oldest can carefully follow the instructions in building the set initially- what a good life skill! Before a week goes by, the set has become something entirely new. Lego is at the top of my list for play that engages the mind.